This groundbreaking study sets out to clarify one of the most influential but least studied of all political concepts. Despite continual talk of popular sovereignty, the idea of the people has been neglected by political theorists who have been deterred by its vagueness. Margaret Canovan argues that it deserves serious analysis, and that it's many ambiguities point to unresolved political issues. The book begins by charting the conflicting meanings of the people, especially in Anglo-American usage, and traces the concept's development from the ancient populus Romanus to the present day. Where are the people's boundaries? Is people equivalent to nation, and how is it related to humanity - people in general? Populists aim to 'give power back to the people'; how is populism related to democracy? How can the sovereign people be an immortal collective body, but at the same time be us as individuals? Can we ever see that sovereign people in action? Political myths surround the figure of the people and help to explain its influence; should the people itself be regarded as fictional? This original and accessible study sheds a fresh light on debates about popular sovereignty, and will be an important resource for students and scholars of political theory. 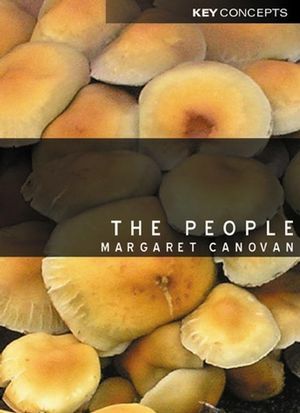 Margaret Canovan is Emeritus Professor of Political Thought at the University of Keele. The Sovereign People in Action and in Myth. 2. 'The People' and its Past. Prelude in Rome: The People in Action. The People in Reserve: From Shadow to Substance. Civil War to American Revolution: the English People in Rebellion. We the People: The American Revolution and its Significance. Popular Sovereignty and Parliamentary Reform in Nineteenth-Century Britain. Popular Government and the People. 3. Ourselves and Others: People, Nation and Humanity. 4. Part and Whole: People, Populism and Democracy. Populism in Contemporary Liberal Democracies. Populism, Democracy and the People. 5. We the Sovereign People. Can Popular Sovereignty be Understood?. Can Popular Sovereignty be Exercised?. 6. Myths of the Sovereign People. the People as a Fiction. The People as Myth and Political Reality. Excellent introduction to one of the most used but least defined concepts in political philosophy. Analyses the concept of the people in relation to the concepts of history, sovereignty, democracy and the nation. Only book currently available which specifically considers ‘the people’ as a political phenomenon. Written in an accessible and entertaining style.